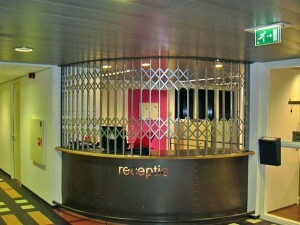 Our rolling grilles and folding grilles are also built according to a resistance class RC3 tested special design. Secure means secure! New brochures – now online! Maximum grille dimensions 4800 x 2750 mm, any dimensions exceeding this are constructed (without certification) based on the RC3 special design. 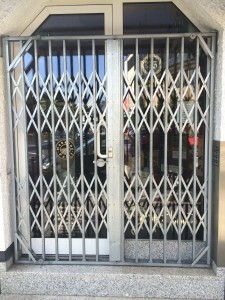 Folding grilles with fixed packages can be manufactured in a top-running design. This version has the advantage of admitting the lower rail directly into the ground as a small U-profile. 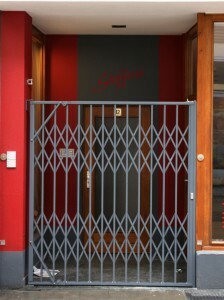 The grille is thus guided into the upper C-rail 40x40x3 mm using ball bearing rollers. If required, the lower rail can be designed foldable as 30x50x30x3 mm U-profile or 25x20x25x3 mm to allow entry into the ground. In certain installation situations it will be necessary for the upper guide rail of the folding grille to be of foldable design. For example, if the rail would prevent reasonable access. The solution for such tricky situations is to fold the upper rail downward. The upper rail – like the lower rail – is given a hinge in order to do this. After the grille has concertinaed, both the lower and upper rails are folded on the folding grille package. Pivoted packages are also possible with this version. 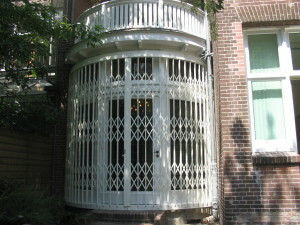 Folding grille can also be constructed to run in a bend – this is technically feasible for a radius of 1.5 m or greater. In this case, the top-running design is always required.